The Ideal 4002 is High Performance 6mm Strip Cut shredder suitable for a large office or department. 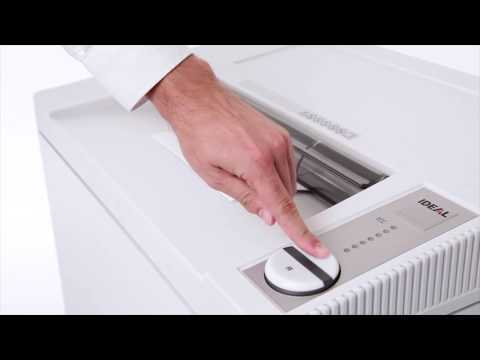 The shredder is designed to shred up to 41 sheets of paper per pass. There is a powerful 1300 watt motor for continuous usage and a huge internal shredded waste box. Fully automatic Start/Stop plus bag full cut-out. The 4002SC shredder has a high quality tall, fully mobile cabinet which accommodates a high capacity 165 litre waste collection bin. Shred up to 4 reams of paper before the shredder requires emptying. The 4002SC model shreds CD's/DVD's and has paper clip proof cutting shafts made from specially hardened steel which are guaranteed for 5 years against damage. This electronic feature indicates the used sheet capacity during shredding process to avoid paper jams. This model features a 40cm feed opening that will accept A3, A4 or A5 paper.